One of my goals for this MoFo Season is to use up some of the odd-ball things from our pantry. I love going to Middle-Eastern grocers, or Indian grocers and buying fun ingredients... but then half the time I don't actually end up using them right away. Plus, I've got various exciting purchases from my world travels languishing with neglect. So, when we made spontaneous plans to have my parents over for dinner, I decided to try out this container of dried herbs for Ghormeh Sabzi. Specifically, dried fenugreek, dried leek, and dried parsley. There was a recipe on the side of the package - so I started there. The recipe called for 1 pound of "stew meat" - but graciously offered a vegetarian version as well "1/2 can mushrooms." Hm. 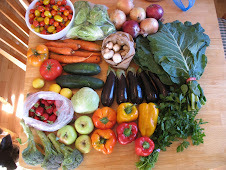 In the end, I got about a 1/2 lb of fresh mushrooms, and a few small eggplants - and used those. The herbs from the package were rehydrated, added to the pot, with some kidney beans, some dried Persian limes, and a few other spices and ingredients. It was definitely not as glorious as Ghormeh Sabzi made with all fresh herbs (but what did I expect, really?). It was sorta card-boardy (yum?) and lifeless at first - but with a good jolt of lemon juice, and more time to stew together with the other flavors, it was definitely good enough to eat and enjoy. I probably won't buy this product again, but I'm glad I tried it. One reason I bought it is that I can't ever find fresh fenugreek around here... and I was curious how the dried fenugreek would hold up. Not really so great, it turns out. Luckily, the second dish I made was an Undisputed Winner. FATTOUSH. 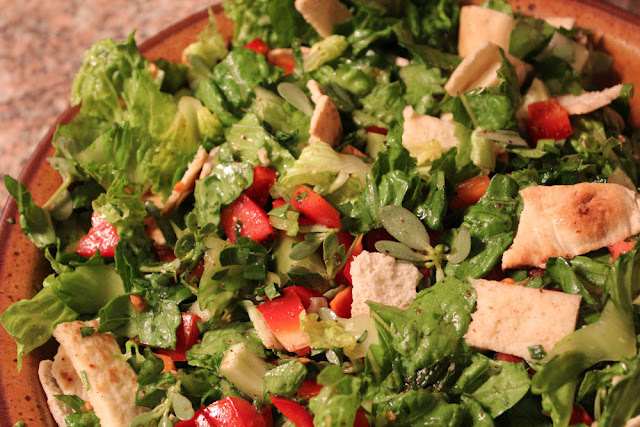 Have you ever had fattoush? If not, you MUST. It is so absolutely perfect, I am left wondering "How is this possible?" None of us could get enough of it - and yet somehow I made such an enormous salad, that there was still enough left over for lunch the next day. I love the simplicity, the freshness, the brightness from the lemon and the sumac, the crisp lettuce and peppers... Plus, I even found Purslane at the farmers market - for increased authenticity, brightness and flavor. 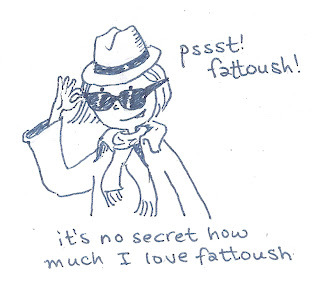 Basically, I am in love with Fattoush, and I want to marry it. I basically use the recipe from The New Book of Middle Eastern Food. I also made a batch of Sumac Tofu to go with dinner. I love dicing up the tofus and mixing them in with the fattoush (less authentic, to be sure!). This sumac tofu isn't the most wondrous tofu you've ever made in your whole life - but it IS yummy, and it's super quick and super easy. No 3 hours of marinating followed by 40 minutes of baking. So it's a great recipe to have around for that reason. All in all, this was a totally delicious dinner - full of flavors and nutrition and colors and textures. Warm, fresh, stewed, grilled, and chopped - so many foodie experiences all in one lovely meal. Plus... sharing it with my parents made the whole thing all the more wonderful! yes! Sumac is one of my favorite spices of all time! you must hunt it down! I am so glad you avoided the canned mushrooms. 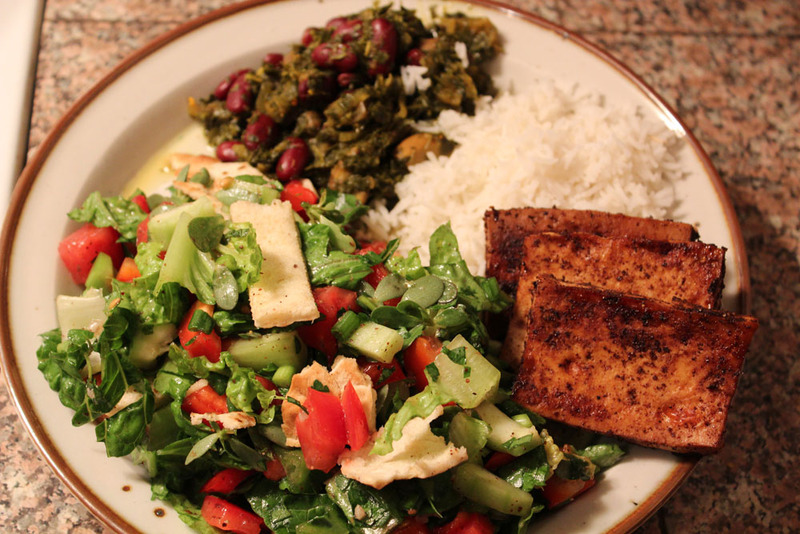 I make my Ghormeh Sabzi the same as the meaty version just without the meat. I don't add any of the extra substitutions and it tastes awesome. It is my absolute favorite Persian dish! 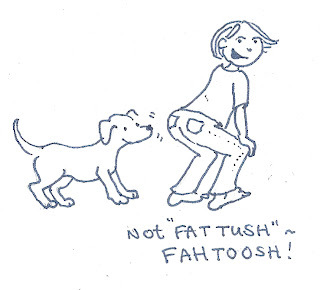 Did you make tahdig with it too? 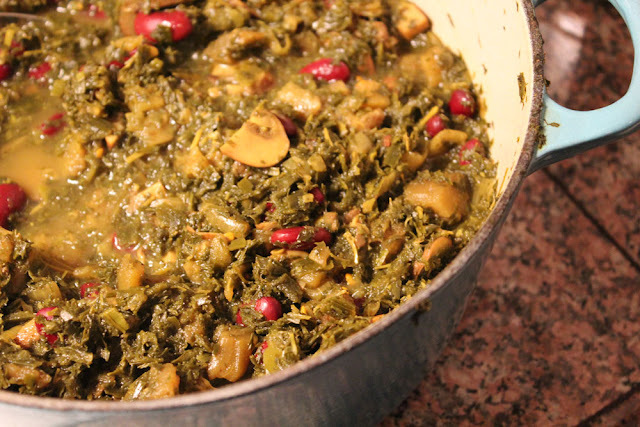 I usually just use extra beans in my ghormeh sabzi... but it was fun with the 'shrooms and eggplant. I love it too. so much. This time I was lazy and just made white rice with it... no tahdig. I know, right? It's so ridiculous. Plus, canned mushrooms?? ew! I had fattoush at our first date in NOLA! I LOVE fattoush. Also, purslane is really interesting stuff, I've only had it once before, but I really liked it. It's sort of sour, if I remember right? yeah! it's sour and lemony and soooo good. It's got a little bite, like I think maybe it's a succulent. It grows like a weed around here, but apparently it has a really strong nutritional profile. I really like the flavor a lot. Viva la Fattoush! I'm not sure but I *think* I had those Persian herbs in an omelet-like dish sometime. It tasted great, but then the dried herbs were brought from Iran by the parents of my friend, not canned. So maybe you could try a tofu-pie with it sometime? or did you finish all of it in one go? Fattoosh is one of my husband's favorite dishes and he always orders it when we go to a Middle Eastern restaurant. For some reason, though, I don't think we've ever made it at home. Hmmm. I love sumac and za'atar! 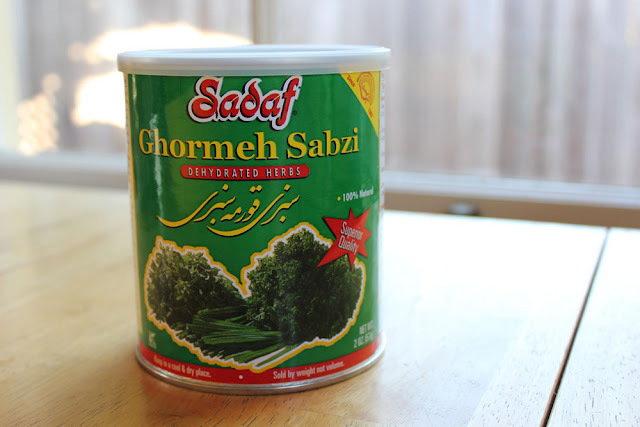 Wow, I've never even heard of Ghormeh sabzi! The Fattoush looks awesome. I love fattoush but I've never actually had it with the pita bread in it. Sumac is lovely - I have some in bulk but am never really sure what to do with it. I like the tofu idea! Fattoush!! It's the best thing ever. 1/2 can of mushrooms as a substitute for 1 pound of meat? Ha. 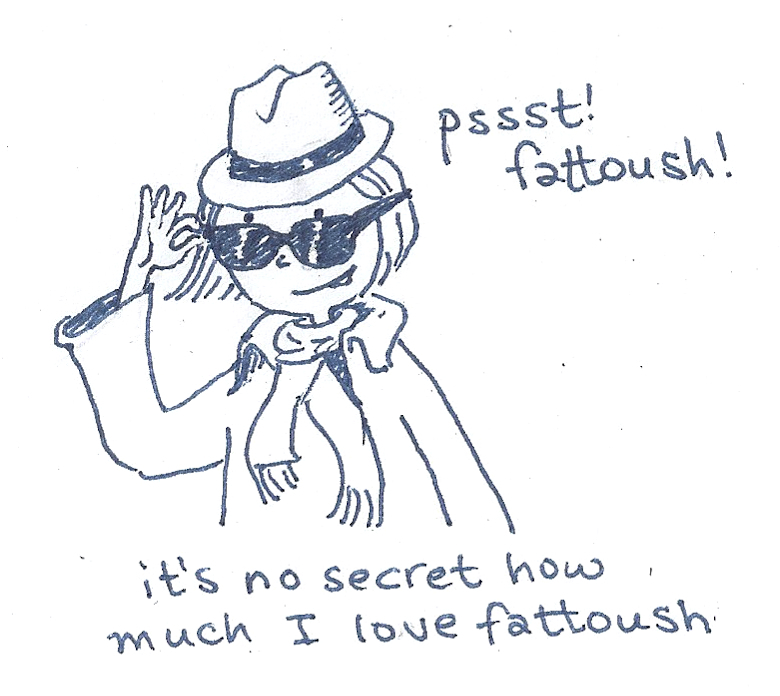 I also love fattoush. And I never even have to make it because P. is a fattoush pro. This post really resonated. I too am a collector of obscure foodstuffs from travels and ethnic groceries. My recent kitchen redo forced me to toss a bunch of stuff that was expired. Now, I'm trying to be judicious before buying. Ethnic markets are like crack to me. 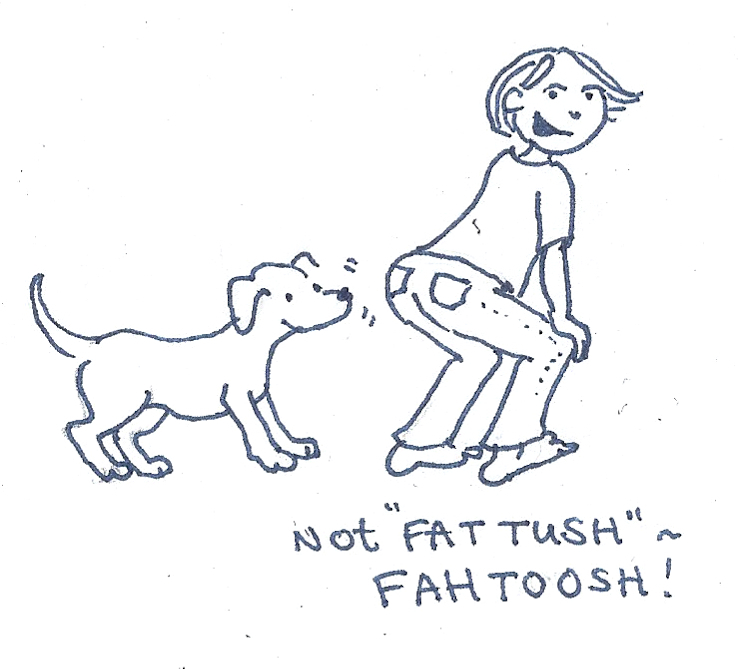 Love your fat tush cartoon. Talented, lady! YUM! Gorgeous pictures. I love Fattoush. That's cool that your parents are up for trying new foodstuffs...mine would probably look at that meal with suspicious, raised eyebrows, ha ha. :) The fattoush does look great though - can't buy purslane around here which is a shame, but I'm sure there'd be a way around that.